Microsoft has just launched its first branded entry-level handset, dubbed the Microsoft Lumia 535, relinquishing the familiar Nokia logo, and establishing the new branding convention for future Lumia devices. 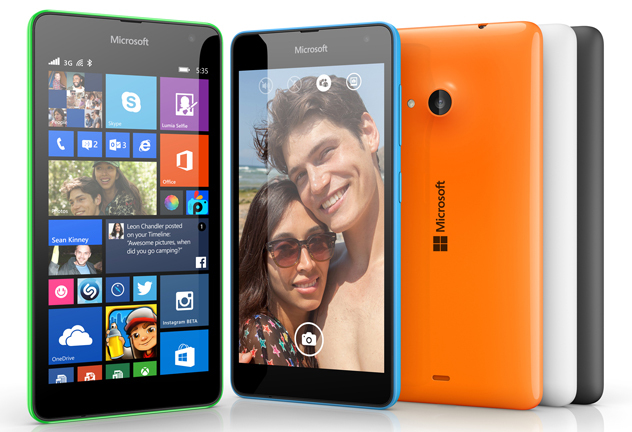 The new Lumia 535 packs a 5-inch screen, 5-megapixel front- and rear-facing camera, a 1.2GHz quad-core processor, 1GB RAM, 8GB of storage with support for up to 128GB with a microSD card, and runs Windows Phone 8.1 OS. It’s available in both 3G Single SIM and 3G Smart Dual SIM flavors, and comes in a range of six colors including cyan, bright green, bright orange, white, dark grey, and black. The device is no flagship, but will probably introduce the new Microsoft brand to many users in developing markets who are interested in an entry-level smartphone. The Lumia 535 will go on sale this month at about $135 before taxes and subsidies, in China, Hong Kong and Bangladesh to start. Sales in other markets including India and Russia are expected to follow subsequently.